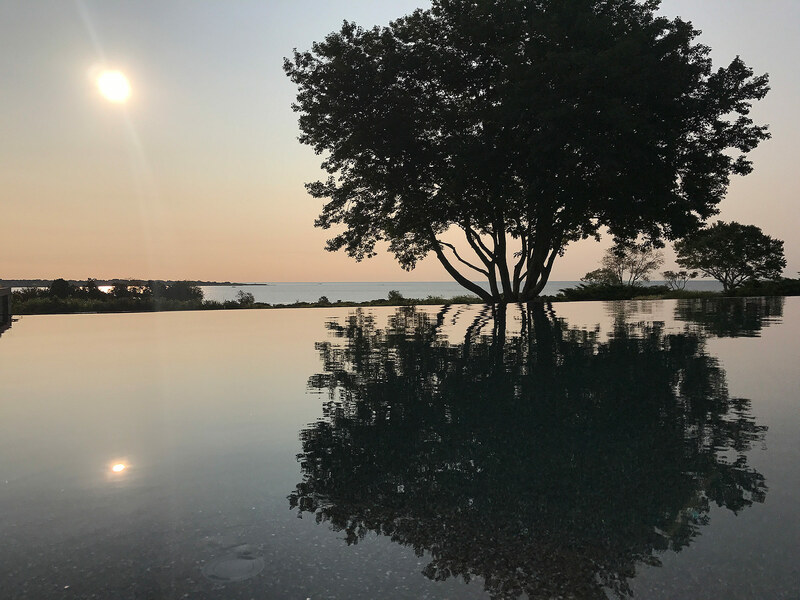 Wide Horizons is a nine-acre parcel of open land along the eastern shore of an iconic New England island. The coastline is protected by a conservation easement, and the viewshed is a sweeping 180 degrees. The house was slated for a complete renovation and the construction of a new pool and pool house. 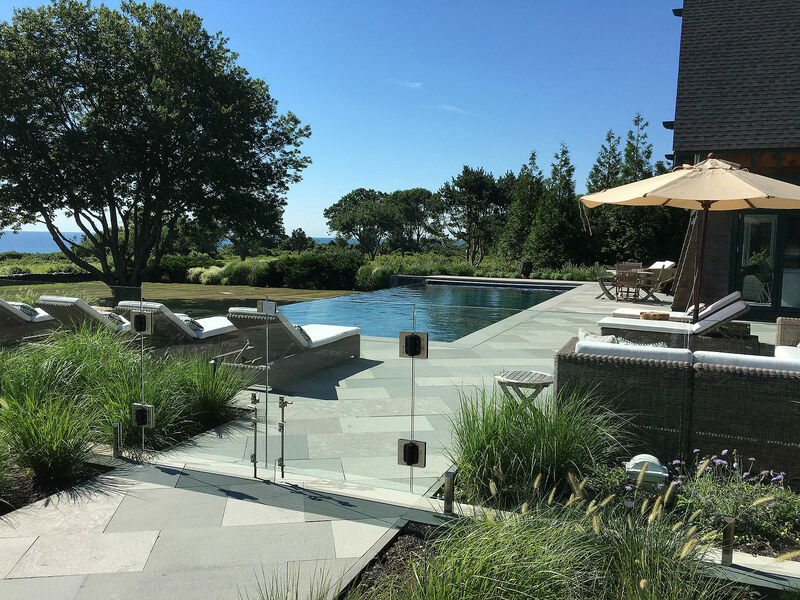 Our project scope included the new pool, planting, lighting, fencing, and the siting of the pool house. 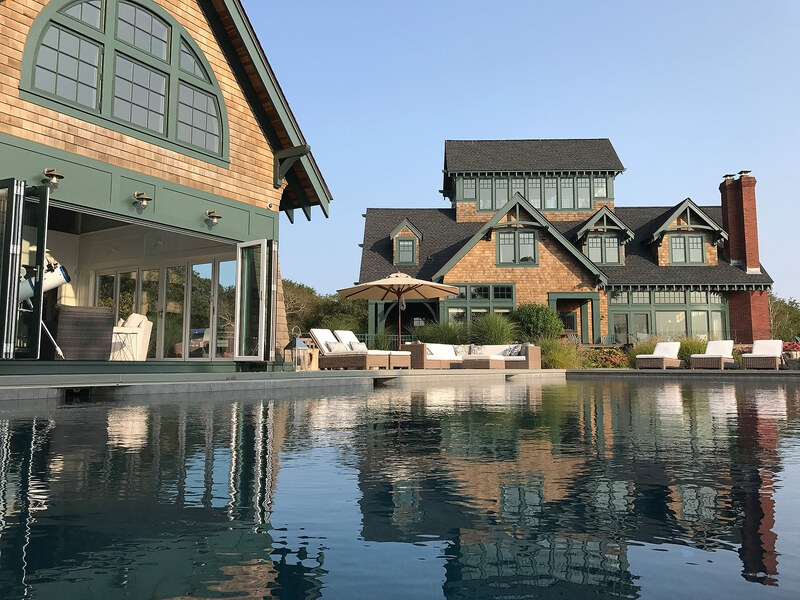 The main challenge was to keep an unencumbered connection with the water and shoreline views. 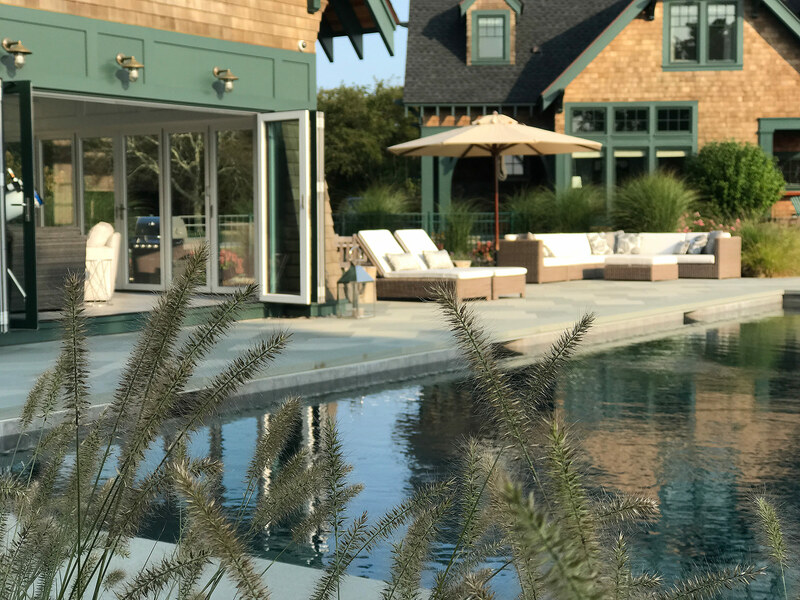 A sloping site accommodates the vanishing-edge pool, and glass panel fencing preserves the visual connections while meeting pool enclosure code. Site analysis uncovered more property than was apparent at first look, and we were able to locate the pool and pool house far enough away from the main house so as to keep the spectacular water views from the driveway and house entry. 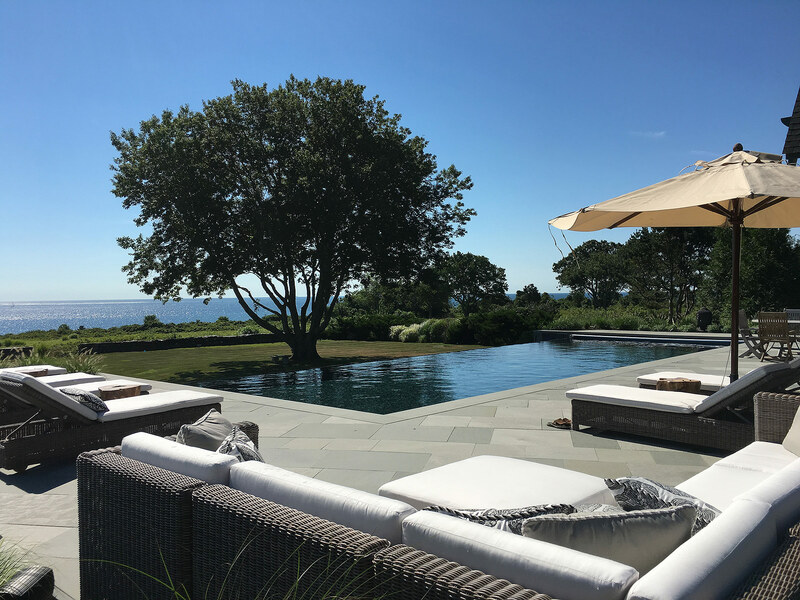 The vanishing edge pool is set at an elevation which permits the pool walls to act as the pool enclosure, keeping open all the vistas of the coastline. Removal of invasive plants and some trees left a raw edge to the existing forest. A native plant palette of clethra, viburnum, red cedars, rosebay rhododendrons, birch, sweetbay magnolia, inkberry, sweetspire, leucothoe, bayberry and ferns increase the visible presence of wildlife and create a natural understory border for the woodland canopy. 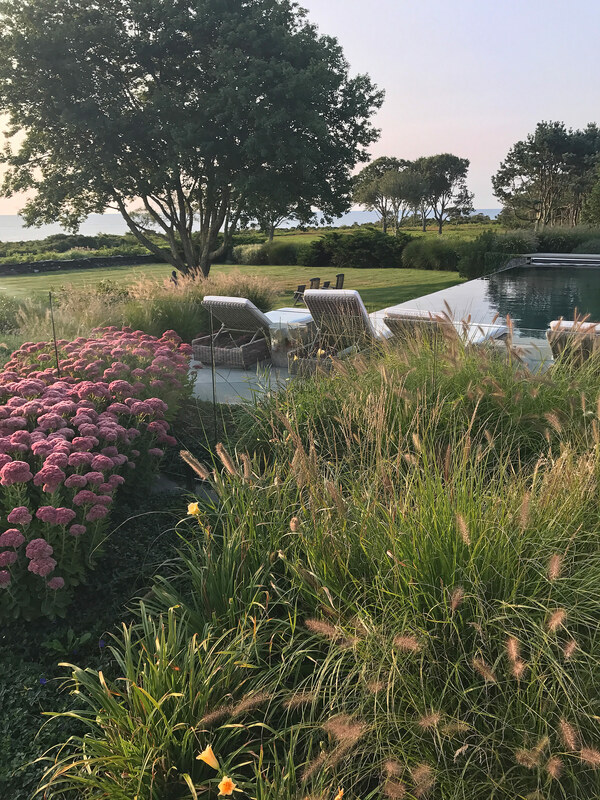 Ornamental plants near the house and pool have a summer focus, combining flowering shrubs, like hydrangeas and roses, with grasses and perennials.